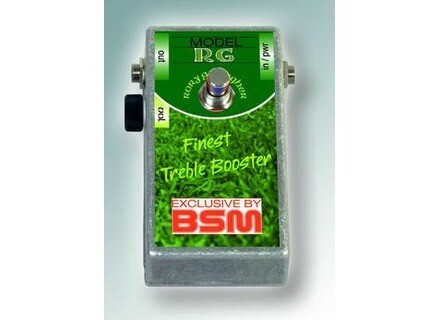 RG, Guitar/Bass booster from Bsm. The BSM RG "Rory Gallagher" tribute model is based on the BSM HS-C Custom model, modified to duplicate Rory Gallaghers signature tone. Compared to the HS-C Custom, the RG Rory Gallagher tribute model is designed to offer more gain for a more punchy sound with a good crunch. The RG Rory Gallagher tribute model, includes the same volume control, like Blackmore's modification on his treble booster. BSM says that when dialed about halfway, you will achieve Gallaghers sound from his early records like "Deuce", "Live in Europe" and "Against The Grain". 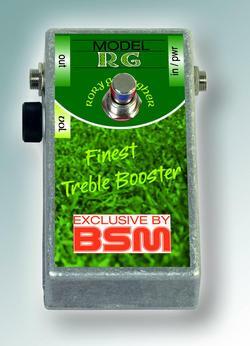 You can check out the new RG at the BSM/Lehle booth G86 in hall #4 at the Musikmesse 2008 in Frankfurt/Germany. According to BSM the booster is true bypass and can be powered only by battery for several reasons — no external power supply AC jack. The BSM full guarantee periods are 1 year for all mechanical parts, including the switch, pots, jacks etc. and 3 years for the electronics. For more information, visit their web site at www.treblebooster.net. Tech 21 SansAmp Character Series Tech 21 introduces their SansAmp Character series which consists of five different pedals: Blonde, British, California, Liverpool and VT Bass. Ernie Ball Slinky Acoustic - Titanium Ernie Ball introduced its new Slinky Acoustic sets, featuring patented coated Titanium RPS Technology that are designed to resist rust and grime. RP350 Now Includes Steinberg Cubase LE DigiTech® is now shipping its RP350 Multi-Effects Modeling Processor with Steinberg's® Cubase™ LE4 Music Production Software.